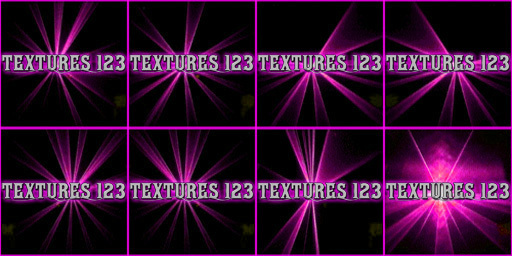 Animating textures on imvu is a great way to make your products stand out from the crowd simply because so many people find them difficult to do. They are a little hard, but they are worth the patience to learn. Animations are actually cycling images, sort of like a story book animation where pages are flipped to create an animation effect. Imvu can show one part of a picture at a time and this creates the animation effect.. Each different movement is a frame we put our individual frames on one picture and then tell imvu to display them one after the other. Please note IMVU DOES NOT USE ANIMATED GIF files for animation. I like to work with frames sized 128x128 this means that my animation can have a maximum of 8 different movements, but its big enough so the image still look good in the client. save this picture and use it for testing. Select the image example above that you have saved to your harddrive. 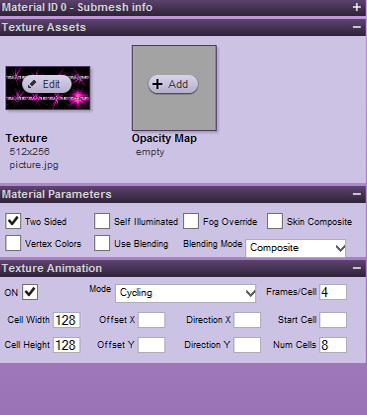 Then look at the Texture Animation parameters. Frames/Cell is where we decide how fast the animation will be 0 is the fastest, I usually find 2-8 works best for animations. Make sure you put the tick in the ON box.